Click the current text of the WIKI page. This action opens a WYSIWYG editor. Edit the text of the WIKI page. For help with formatting the text, in the bottom-right side of the editor, click Markdown syntax help. Note: You can also attach a file when you are adding or editing the text for a WIKI page. To do this, drag and drop the file you want to attach in the text box – the attached file is automatically added to the list in the attachments section of the WIKI page and to the WIKI text as a string. 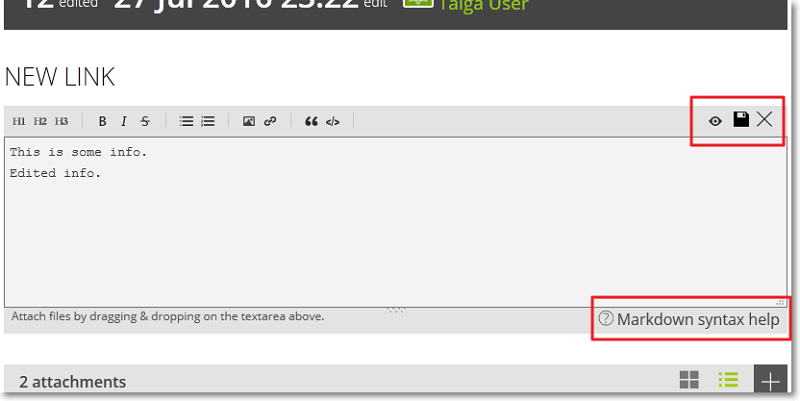 In the top-right side of the editor, click to save any changes made. Note: To preview the edited text, next to the save button ( ), click ; to return to the editor and continue editing the text, click or, to save the description, click .